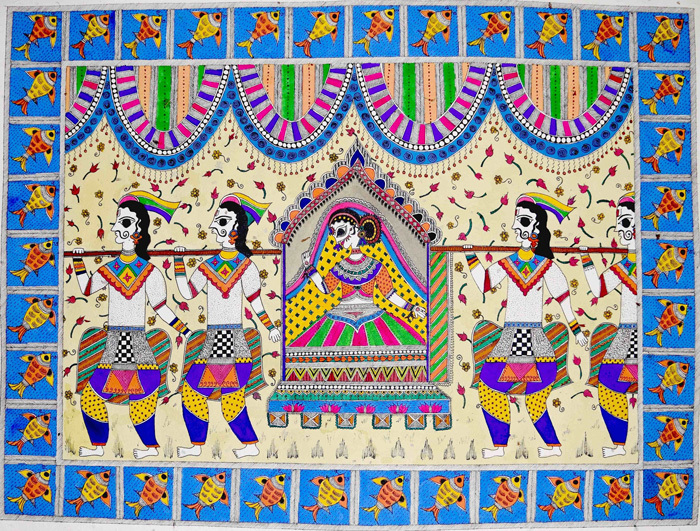 "Palanquin bearers" by Shruthi vembar. Guest post by Shruthi Vembar. GSA-Art features the creative works of scientists. Read more in GSA President Stan Fields’ call for submissions. If you would like to submit your own work or nominate someone else’s, please send an email to GenesToGenomes@genetics-gsa.org with “GSA-Art” in the subject line. 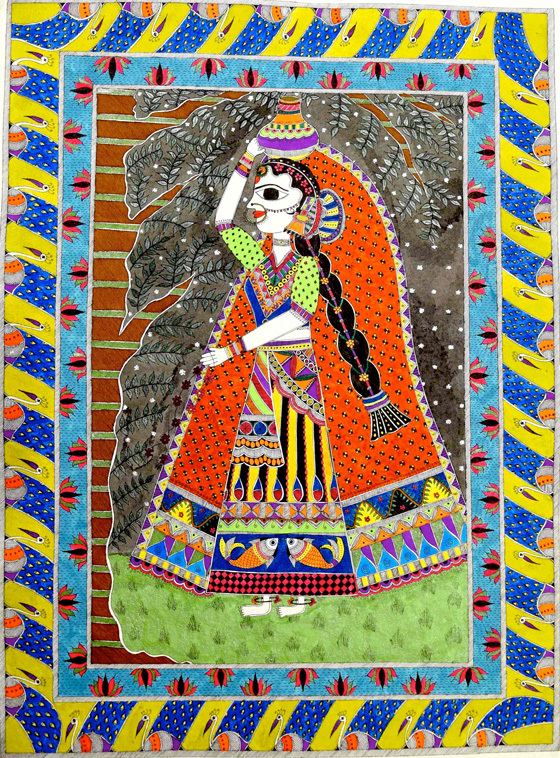 Madhubani painting, also known as Mithila painting, is an art form that originated in Northern India, in the border between Nepal and the state of Bihar. 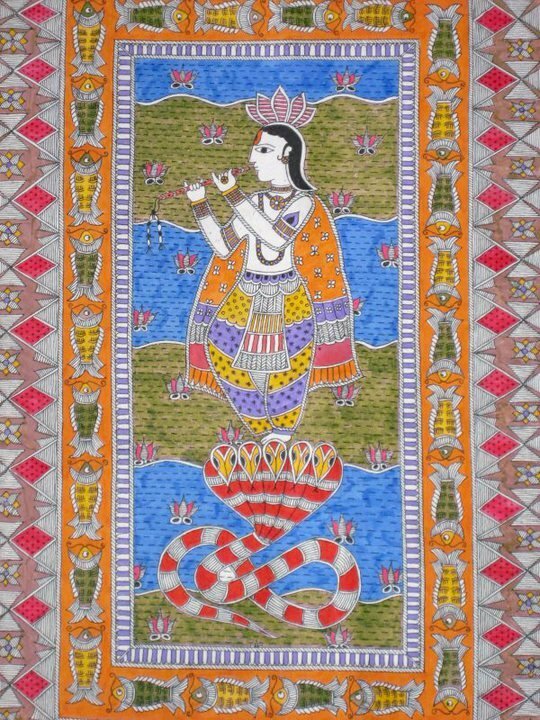 Not much is known about the lineage of this centuries-old art tradition except that it was a domestic ritual practiced by women, for example on the walls of their homes, and was highly individualized. 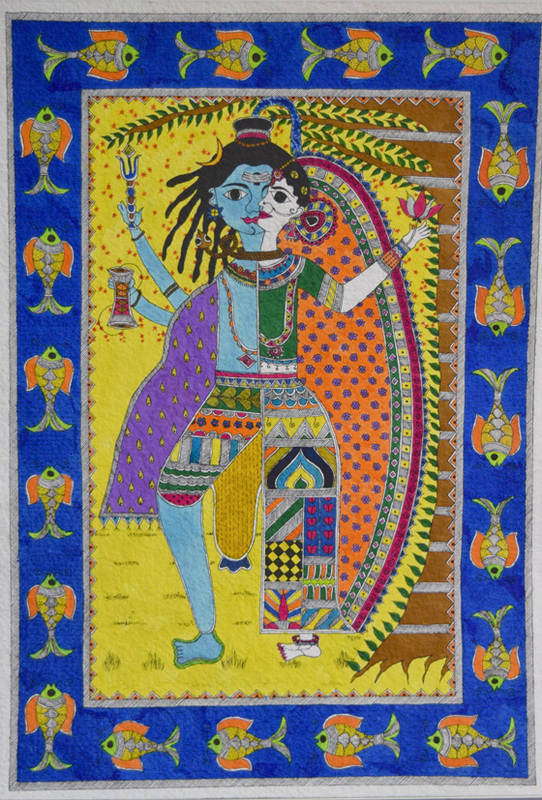 Although commercialization led to the over-simplification and repetition of select themes, contemporary Madhubani painters, especially local artists from Bihar, still remain true to the distinct aesthetics of this art form while incorporating contemporary and socially charged themes such as women’s empowerment and social transformation. 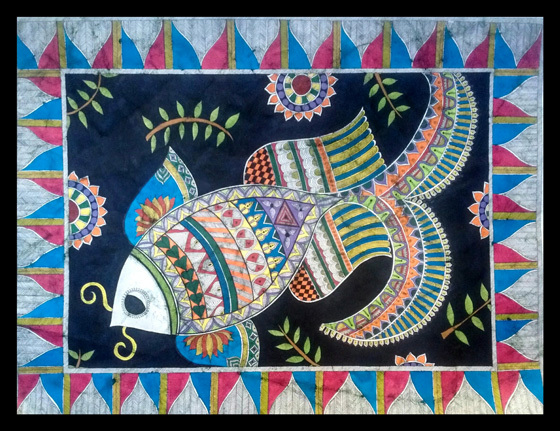 I started Madhubani painting six years ago, when I took a break in Bangalore between my PhD and postdoc. 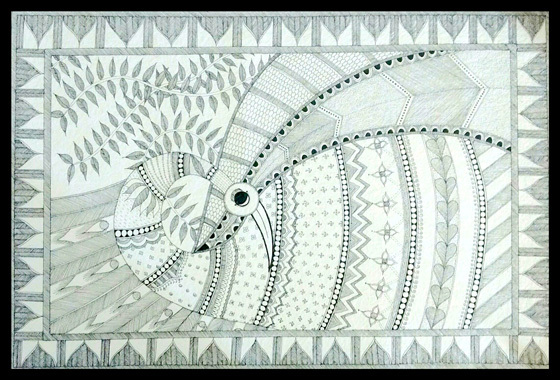 I use handmade paper and drawing ink to paint Madhubani pictures. My first encounter with this art form was when I created “Kalinga mardana”. 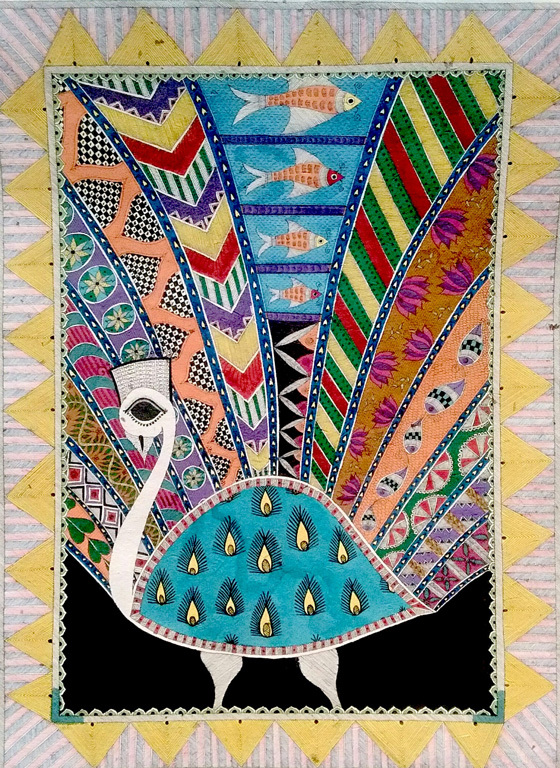 The richness of color, design and symbolism had me hooked and I kept going back for more—this resulted in paintings such as “Ardhanaareeshwara”, “Resplendence” and “Of men and birds”. The repetitive, geometric patterns coupled with the construction of a unifying narrative make the process of creating these paintings meditative and highly rewarding. In fact, I find that the creative process I use for painting complements the scientific thinking process and helps me to bring innovation and originality into my research. 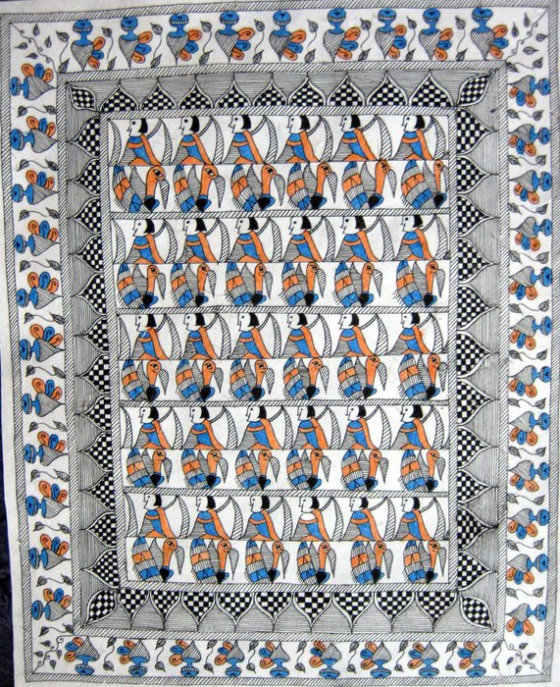 I have now painted several Madhubani pictures and given them as gifts to my family and friends on special occasions. 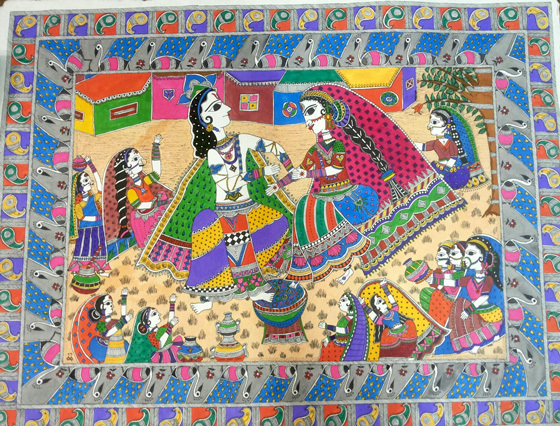 For instance, “Woman and pot” and “Vibrant Peacock” were gifts to my friends for their 40th and 30th birthdays, respectively, while “Palanquin bearers” and “Raasleela” were wedding gifts. In Henri Moore’s words, “The creative habit is like a drug. 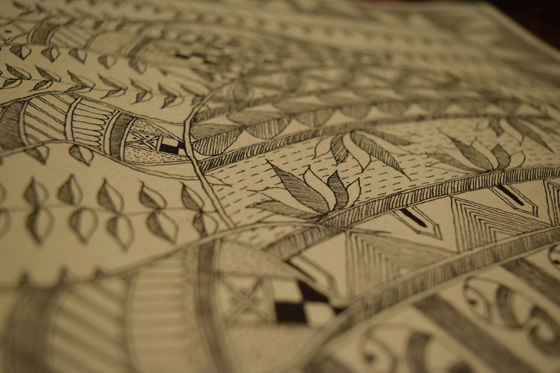 The particular obsession changes, but the excitement, the thrill of your creation lasts.” I feel truly grateful for my two great obsessions, Madhubani art and science, and cannot imagine my life without them.